Applied Posture Riding is a new Riding wear brand and is exclusive to APR. These products have been designed or selected by Annette Willson. These new products are designed to be comfortable, look good, feel good and assist you in supporting your core while riding and working around the stables. The women with a bigger tummy can now be wear riding clothes and still look good while wearing jodhpurs and riding. Lightweight microfiber fabric, 280g full stretch suede seat. 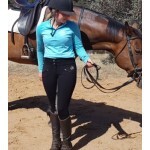 The most comfortable breeches you will ride in! Knitting fabric, 420g full stretch silicone print seat. Black only with grey silicone print seat.